I have a habit of dressing Scarlett like me without even planning it out. Often I dress her and then look in mirror to realize that we are twins. This day was one of those days. I guess I was feeling the florals. My floral peplum corset was from American Eagle & Scarlett's was from Old Navy. So cute ! We need to collaborate ! Let's do it! :) I would love that. I really like the corset that you have on. Pretty. It's fun to match our girls. Seriously so cute! I love her style, and obviously yours too. I can't wait for my baby to be old enough so we can start matching too. This is too stinking cute. Love that you two are twins! 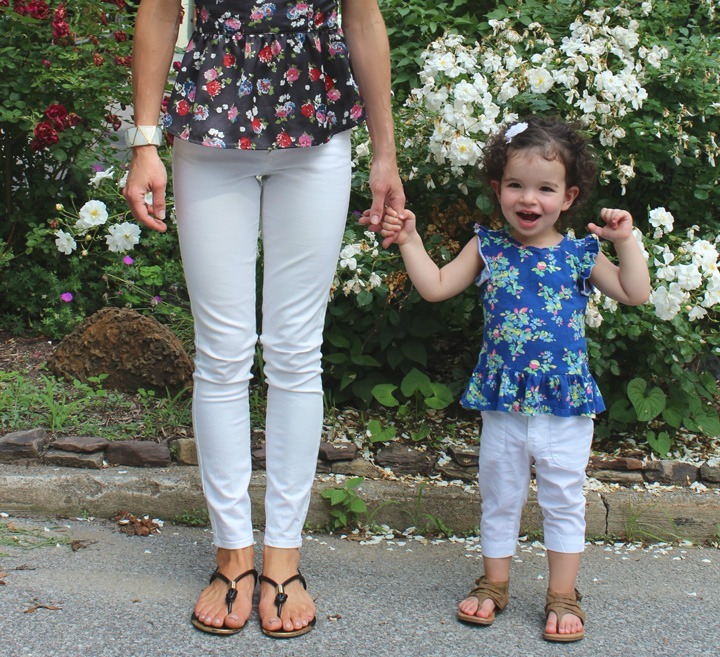 Peplum has never looked this sweet! Aww, you guys are both beautiful and I love the coordination! My daughter and I often end up dressed accidentally the same...and sometimes on purpose! Love your top, it really pops with the white jeans. so cute!! Love mommy and daughter pics!! Thanks for linking up!! Thanks for linking up for Passion For Fashion, hope to see you back tomorrow!